New Directions Primary Dept donated 2 wedding cakes to Caerleon Endowed Infants School to celebrate the Royal Wedding. 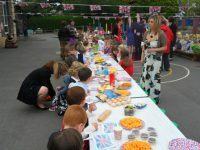 The school held a garden party which saw the children dress as Prince’s & Princesses. Throughout the day assemblies were held showing the children a brief history of the monarchy and pictures of Wills & Kate from baby to present.